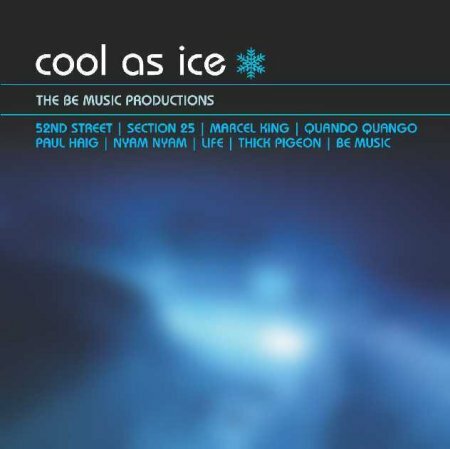 LTM are proud to present Cool As Ice, a compilation of stone classic old school 80's electro and dance cuts produced by Be Music, the tag used by all four members of New Order. The set will be available late August 2003 both on CD and as a limited DJ friendly double vinyl set. The album has been digitally remastered and runs for 74 minutes. The vinyl version will be limited to just 1000 copies. Update 19/08/03 from LTM: "The gorgeous (and strictly limited) double vinyl version of Cool As Ice will also be in stock at the end of the week, and will be promptly dispatched to those who have already ordered. Rest assured that it will be sent out in a strong cruciform type box mailer, so there should be no bending or creasing of the sleeve at all. Anyone who has not already ordered might want to do so now to avoid disappointment! Cost is �16.50 in the UK, �18.00 in Europe and �19.00 for rest of world, airmail postage included. Sorry about the all-in price but vinyl is now a very expensive format to produce, and we really are pushing out the boat on the safe post/packing." Nice one James. LTM pull the classics out of the bag including Marcel King, Quando Quango and Section 25. Essential listening for 2003 and beyond!